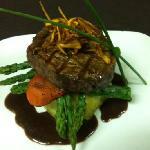 Description: Wagg's Steak & Seafood Restaurant has been locally owned and operated for over 24 years. 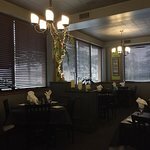 We are a casual fine dining restaurant tucked into the Super 8 Motel just a few minute drive from the Bluewater Bridge. With ample space for 90 diners, the atmosphere is supremely modern with intimate dining areas sectioned off with solid oak partitions and a candle at every linen-set-table. 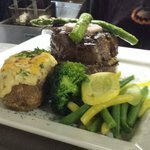 Specializing in fine quality Prime Rib, Steaks, and fresh Seafood. We also offer a wide selection on our menu that include chicken and pasta dishes, as well as lunch items such as fresh made wraps, sandwiches and salads. We also offer vegetarian and gluten free entrees upon request. Wagg's Restaurants main specialty is Prime Rib. 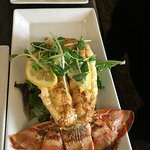 We also specialize in Certified Black Angus steaks, Lobster, Alaskan King Crab, along with other fresh Seafood and Chicken entrees. We also have a great lunch menu that is available Monday to Friday. 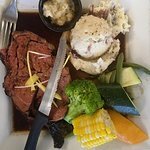 Wagg's also has a private banquet facilities to accommodate up to 100 people for your special occasion, and take out orders are available on all lunch and dinner items. A restaurant that has always been a place for that special get together. It’s been a couple of years since I dined here. Boy was I ever delIghted with the menu. Of course everyone comes for the famously delicious Prime Rib. Those who had it in my group where delighted. I myself thought i’d stay away from the beef that day so I ordered off of the menu escargo and a Greek Salad. Boy was I in for a treat. I can truly say it was one of the best I’ve ever had. It came in a traditional escargo plate. However what made this special was the escargos where toped with mushroom caps and then smothered in a blend of cheeses. Yummy good! Since my meal was paid for from a fund we have for a retires group I belong to I thought I could spoil myself and buy a Ceasar, on my tab. Again it was a delight. As Ceasars go this truly was the best I’ve ever had. It came garnished with a meal on a stick across its rim. All and all our lunch experience here was exteamly enjoyable. Belive me pleasing a group of Srs that dine out together once a month on a regular basis can be a challenge. Waggs gets my thumbs way up. Thank you to the Chef and the wonderful servers who went out of their way to show us excellence. 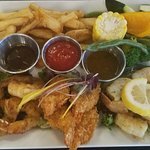 Always a first class experience with the best food and service available in Sarnia. We visit Waggs for special family dining as much as we can and have always had an excellent time. 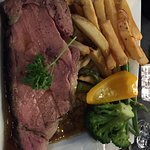 The menu provides something for everyone as the prime rib and steaks are always done to perfection and the pickerel dinner is very tasty. I would highly recommend Waggs for an incredible dining experience at a very reasonable price. Can't wait till our next visit. I can't say enough about the amazing food this restaurant serves! I reserved a table for two on Valentines for my wife and I (thank goodness as they were very busy), Service was fantastic right from the moment we arrived! I decided on the French onion soup as an appetizer and I can honestly say this restaurant does it right, absolutely delicious with the melted cheese, soft bread and loads of onions in a rich broth....you MUST try it! For dinner my wife had the New York steak which was done to perfection (this place is well known for their steaks) and I had the Pickeral dinner which was lightly breaded and lots of it! We both finished our dinners with no room for desert (unfortunately!). 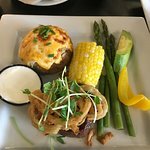 Do yourself a favour and visit Waggs steakhouse for an incredible dinning experience at a very reasonable price. Thank you! 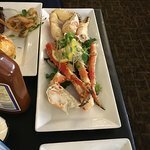 Been to Waggs Steak & Seafood? Share your experiences!